1899, in the 80th year of his age. Tuesday, Feb. 28th, at 3 o'clock p.m. 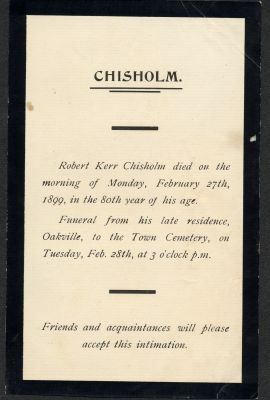 The third son of William Chisholm, Robert Kerr Chisholm, was known throughout his life as R.K. At the age of 20, in 1839, William deeded to R.K the property on which he ran his general store and his customs operations. At the same time, William was also appointed deputy for the posts of both Collector of Customs and Postmaster. 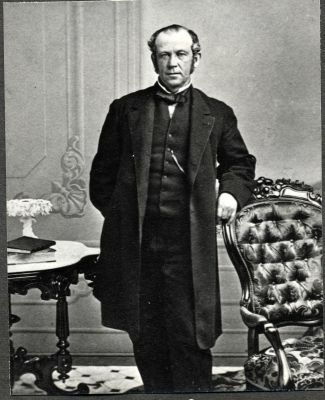 When William passed on at the young age of 54, R.K took on the responsibility of being the Collector of Customs and Postmaster for the increasingly busy port of Oakville. R.K served as Customs Collector and Postmaster for a period of 55 years, one year longer than his father had lived. R.K passed on at the age of 80 in 1899 due to ill health.